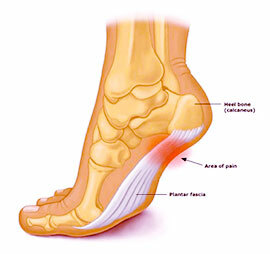 Plantar fasciitis is a condition wherein the plantar fascia is pulling on the periosteum at the calcaneus therefore causing inflammation and pain. The plantar fascia is connective tissue that acts as a stabilizer and maintains the integrity of the arch of the foot. It originates at the plantar aspect of the calcaneus and is attached to the metatarsal heads and continues forward to insert on the proximal phalanges as well as forming the fibrous flexor sheath in each toe. Patients complain of severe pain felt in the heel at the hindfoot (plantar surface of the calcaneus) particularly when they take their first few steps of the day, or after they have been off their feet for a prolonged period of time. Pain after rest! The plantar fascia is repeatedly over-torqued because the calcaneus in the hindfoot is stable while the forefoot is over-pronating. 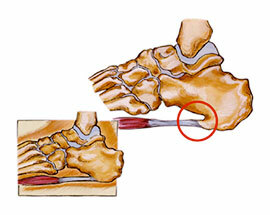 This shearing force causes the plantar fascia to become inflamed. Because the weakest part of the plantar fascia is the attachment to the periosteum (fibrous membrane covering the bone) at the calcaneus, pain on the medial side of the calcaneus is felt. When the plantar fascia is repeatedly twisted, it pulls the periosteum away from the calcaneus and causes the pain and inflammation. If this happens often enough, the calcaneus will eventually grow toward the plantar fascia in an effort to re-attach itself. That bone growth is called a heel spur. The pain is felt during the first few steps of the day because during the night, the fibres of the fascia try to heal themselves by forming fragile new fibre, and when the person puts weight on the foot, renewed tearing takes place and the pain becomes severe. Treatment options vary according to symptoms. If the pain is caused by over-pronation and continuous torquing of the fascia, an aggressive, more rigid orthotic is needed to arrest the torquing and stabilize the forefoot. If the pain is found in the middle area of the plantar fascia, aggressive rearfoot control is needed and can be found with orthotics. Since the problem is the over-pronation, orthotics that control pronation and arch elongation should be prescribed. The patient can expect a 20-25% improvement every 2 weeks until complete recovery, which generally takes 2 to 3 months.